When John Young and Bob Crippen launched on the space shuttle Columbia on April 12, 1981, it was the dawn of a new era. NASA's shuttle program would go on to achieve great things, and suffer two terrible losses, over the course of its 30-year history. 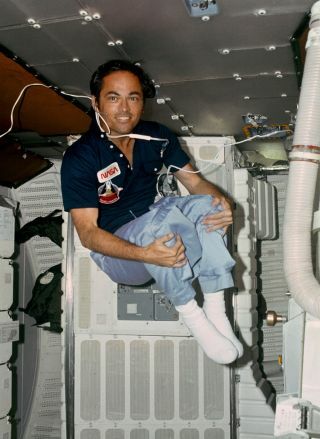 SPACE.com talked to STS-1 pilot Bob Crippen about his rookie spaceflight on the shuttle, and the 30 years that followed. SPACE.com: How do you feel coming up on this big anniversary of your STS-1 mission? Crippen: Well, it doesn't seem to me like it's been 30 years. Three decades is a pretty long time. SPACE.com: Take me back to your launch on STS-1. What was it like to make the very first manned test flight of a new spacecraft? Crippen: Well, it was fantastic. John Young and I were both trained as test pilots, so flying the first on any vehicle is especially appealing to a test pilot, so that was the case with us. SPACE.com: Were you especially nervous because the space shuttle hadn't been tested manned before? Crippen: No. I was excited, there's no doubt about that. But John and I had trained for this a long time, we knew the vehicle very well, and it was discussed whether it ought to be flown unmanned initially. But John and I were both proponents of us being onboard, because we thought the flight had a bigger chance of success, and it would have been very difficult to make it unmanned on the first one. So I was excited after having waited so long for that initial flight, and was pleased to be going with a real pro like John Young. SPACE.com: Was it a special honor to be on the first space shuttle crew? Crippen: Absolutely. There were lots of guys in the astronaut office who would have liked to have been in my place. And like I said, I'm not sure how I ended up being selected for that first one, but it was truly an honor. You know, the '70s weren't really a great time for the United States. We had had some pretty bad events with hostages in Iran. And President Reagan was shot just before our flight, and it was not exactly a good time for the United States, so to finally have a success like that made us feel proud, and I think it made the country feel proud as well. SPACE.com: Before the flight, how confident were you that the shuttle would fly as planned? Crippen: Well, truthfully, I wasn't all that confident. You know it's a very complex vehicle and a lot of things have to happen correctly for actual liftoff to occur. We tried on April 10 to launch, we ran into a computer problem that they quickly resolved and allowed us to countdown again on April the 12th. And truthfully, I did not think that we were going to. I thought that we would run into another problem, and it was only when the count got inside one minute that I turned to John and said, "I think we might actually do it." SPACE.com: You had some anomalies on that flight – how significant were those? Crippen: Well, you know, that's what as any test flight is for, is to find any things like that that might go wrong and correct them. Ours were not serious, and we did correct them. We were flying the first stage on the solids, we had on one of our cathode ray tubes, a display of the profile that we were supposed to be flying, and we were going well above it, but that's better than going below it – actually the vehicle had more lift than what they initially found. And on orbit, we had a few things go wrong with some heaters and that kind of stuff. SPACE.com: You had ejection seats inside the shuttle. Could those really have worked? Crippen: Truthfully, you know, I was not part of the decision process that decided to put ejection seats in. But since we were a test flight, the powers that be at the time thought that we ought to have ejection seats. That's why the crew was limited to only two people initially, because you could only fit two seats in. If you've ever watched the shuttle launch and you've seen that big trail of flame that comes out of the solid rockets, if we'd ejected, we'd have ended up going through that tail of fire, and survival was not very probable. The only time that I thought the ejection seats were potentially something we could have used — if we had run into a problem coming in for a landing, from a control standpoint, where we weren't able to reach our landing site, you possibly could have used them then. But I didn't really think that they gave us that much more of a chance of success. SPACE.com: What was the actual feeling of launch like? How did it compare to what you imagined? Crippen: Well, that's one of the reasons I was pleased to be flying with an old pro like John. John had flown in Gemini and he'd flown on Apollo, so he had experience with those kind of vehicles and he described it to me a lot. But actually the shuttle launch, they constrained so that the load factor, the Gs, the acceleration that you feel on you is only 3 Gs. And the older vehicles, they were often times 5 or 6 Gs, and 3 is not very significant at all. But they didn't do that for the crew, they did that for the payloads that the shuttle was going to be carrying in the future. When the solid rockets fire you get a nice kick in the pants, you know you're headed someplace, you hope it's in the right direction. There was a little shaking during first stage, but as soon as the solids were jettisoned, it was a very smooth ride, and my eyeballs were probably as big as saucers. You're going from sitting on the pad to going 17,500 miles an hour in 8 1/2 minutes, so that's quite a ride. SPACE.com: During your first flight, was it all work, or was there any time for playing around in zero-G? Crippen: Well, there were only two of us onboard and there was a lot to be done, so we were pretty busy most of the time. But we did find time to enjoy floating around and being weightless and looking out the window at this beautiful spaceship Earth that we happen to be fortunate enough to live on. SPACE.com: What did it mean to you that your launch ended up falling on the anniversary of Yuri Gagarin's Vostok 1 flight? Crippen: At the time I didn’t even think about that, but later, I thought it was pretty neat to have that event occur 20 years after Yuri had flown. I think maybe some in the Soviet Union thought we had planned to go on that date, but we actually tried to go on April 10, and the 12th just happened to be the next available date. SPACE.com: Do you think the space shuttleprogram lived up to hopes people had for it? Crippen: Well, it certainly lived up to the hopes that I had for it. However, it was touted to reduce launch cost and fly very frequently and it never lived up to those objectives, which in my mind were completely unrealistic in the first place. All told, if you look what the shuttle has done in the past 30 years, from all the payloads it's sent up, including a lot of military payloads early on that probably helped the United States win the Cold War, and then we launched a number of satellites including the Hubble Space Telescope, which has revolutionized our knowledge of not only our solar system but the entire universe. And then to construct something as marvelous as the International Space Station. That wouldn't have been possible without the space shuttle. SPACE.com: What's the pinnacle, in your mind, of the shuttle's achievements? Crippen: Wow. It's had lots of them. Probably the Hubble Space Telescope, and the fact that it continues to give us fantastic knowledge of what's going on in the universe around us, and then the International Space Station is a pretty remarkable engineering achievement. SPACE.com: How do you feel about the fact the shuttle's going to be retired this year? Crippen: Kind of bittersweet. I think it's accomplished a lot and I'm proud of all it's accomplished, and I believe in moving on. I'd like to see us get out of Earth orbit and go back to the moon and asteroids and eventually on to Mars. And that wouldn't be possible with the shuttle, it just wasn't built to do those kinds of things. Unfortunately we can't afford to operate both of them. The only thing I really regret is that we are grounding the shuttle before we've got another capability to get up in space. I put a great deal of pride in what the United States has accomplished, and I'm not very happy about the fact that we'll be dependent upon the Russians to take our people into space in the future. SPACE.com: Your first flight was on Columbia. Have you always felt a special connection to that orbiter? I imagine it was a huge blow when the accident happened. Crippen: Well, it certainly was. I was always so fond of Columbia, but I also flew three subsequent flights on Challenger, and felt very akin to that one, and the same way when we lost her. Those were very sad days and great tragedies for us. SPACE.com: How did those disasters affect the trajectory of the shuttle program? Crippen: Well, they certainly modified it. Initially when we lost Challenger, it became very obvious to us that we were flying with some deficiencies in the vehicle that needed to be corrected. And we stood down to try to correct those deficiencies and change the way we were managing the program. Initially when we were flying the shuttle, space shuttle was supposed to be our only launch vehicle in the United States. We were going to put up all civil, military and commercial payloads. And the decision was made after we lost Challenger that we would constrain that and only use the shuttle for things that it was necessary to have people onboard for. So all the commercial stuff went away, and all the Department of Defense stuff went away, which constrained the things that were available for the shuttle to fly. You know we could have flown reasonably, at least a dozen times a year, but we never reached that amount. But we were operating very successfully. I was pleased. After I retired and we lost Columbia, that was another kick in the stomach. I felt after looking at the accident report that we had forgotten a lot of the lessons that we had learned after Challenger, which sometimes happens over a period of time. But I'm pleased that we're back flying again safely. And you know what, if we needed to, or people desired, we could continue flying the shuttle much longer and I believe we could do it safely. SPACE.com: Have you and John Young remained close over the years? Crippen: Oh, yeah. John lives in Houston with his wife, Susie. And I now live in Florida, but I still have kids and grandkids back in the Houston area, so I get back there periodically and usually have a chance to go by and see John and have a cup of coffee or lunch with him. In fact I need to give him a call when you and I get off the phone about something else.